WHILST MAINTAINING GOLF'S UNIQUE CHARACTER OF COURTESY AND FAIRPLAY. There are no organised competitions, Friday to Monday, so the golf course is open for "Friendly Golf"
The Golf Range is open all daylight hours. Self service. Clubs loaned free. Our policy is to have very few Tee Reservations so you can play almost anytime. However, please give us a call or check our Calendar. "for what's happening NOW please click Facebook on left menu"
PGA Professional tuition, all equipment and a coffee in the Clubhouse. Come on your own or with a friend, you will be very welcome. Saturdays - 10am Free Junior Clinic includes all equipment. but it may not be clear how you can give it a try. Why get into GOLF ? friends and new friends in beautiful surroundings. A game for girls and boys of all ages and abilities ( toddlers to 90s) A tonic for good health and happiness. You can enjoy golf for half an hour or for the whole day. Trainers and casual clothing acceptable. Taster sessions at Sudbrook Moor around £5 , on Wednesday mornings at 9.15am, include PGA coaching to start you on the right path and a coffee in the clubhouse afterwards. No obligation, no pressure, dip in and out as you wish. All equipment and Golf Range fees included. Free Junior Clinic every Saturday. Affordable options to carry you forward. Individual or shared coaching sessions. Play as a Visitor with hire clubs provided or become a Member. Low annual fee and low green fees. Special 2 month complimentary membership included with 3 individual half hour coaching sessions with PGA Professional Ben Hutton, at Sudbrook Moor Golf Club ( currently £60 ). If you are competitive there are competitions with a unique handicapping system. Sudbrook Moor is the place to give golf a try. Golf Shop with PGA Professional advice and proven products at the best prices. Fiona’s Restaurant in the Clubhouse for tasty homemade snacks, meals and beverages. Please get in touch, you will be very welcome. MEMBERS' GREEN FEES: £4 Jan to May, £5 Jun Jul, £4 Aug to Dec. THE GOLF COURSE HAS 9 HOLES with an 18 hole experience achieved by playing to different flags on the back nine. ( Par 66, 4,549 yards with 12 par 4s and 6 par 3s ) The 9 Hole Green Fee allows you to play unlimited golf, all day. Visitors' Green Fees: £12 - £14 weekend/bankholidays June July £14 - £15. THE DRIVING RANGE provides quality golf balls on 6 covered bays, 6 open air bays and a private coaching bay. There are 2 practice putting greens, a chipping green and a practice bunker. FIONA'S BISTRO provides refreshments after 9 holes or 18 holes. MEMBERSHIP SCHEME AVAILABLE A small yearly outlay and a small "pay and play"fee provides even greater value for regular players, who also have the opportunity to gain an Official Handicap. DISTANCE MEMBERSHIP for players living more than 50 miles away, gives access to a Recognised Golf Club Membership with all of the advantages that provides. COACHING is available with PGA Professionals. A PGA Professional's Shop with over 40 years of continuous Professional experience in the locality, providing ongoing Professional advice and top quality, proven, products at competitive prices. A PGA Repair Shop undertakes most club repair work.
" TURN UP AND PLAY ANYTIME" is achieved by having the 1st tee open for play almost all the time. To this end we do not have visiting golf societies. Groups of up to 12 players may play without a tee reservation. WE HAVE VERY FEW TEE RESERVATIONS. The tee is closed every SECOND SATURDAY OF THE MONTH during the MORNING for The Monthly Medal. There are 5 A Team League home matches per year, which occupy the 1st tee for part of 5 Saturday afternoons. 5 Seniors League home matches occupy the 1st tee for part of 5 Thursday mornings per year. The only tee reservation on a Sunday is The Club Championship sometime in July until 10am. There may be one or two other special occasions during the year but otherwise the Golf Course is OPEN FOR PLAY NEARLY ALL OF THE TIME. 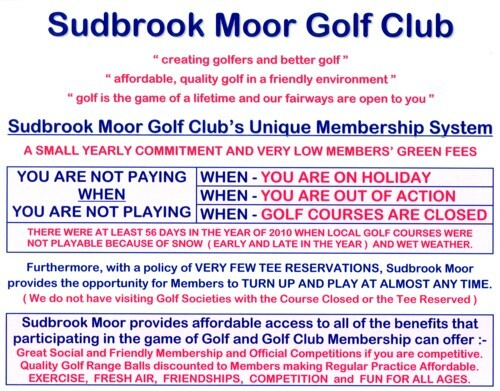 SUDBROOK MOOR GOLF CLUB makes it easy for you to play golf, providing affordable, quality golf, in a friendly atmosphere. Situated 6 miles North East of Grantham, the club was created and developed by award winning PGA professional Tim Hutton and is managed with the help of his wife Judith and family, Ben, Simon and Fiona. An ideal setting for both starters and more experienced players, the course is testing, without being too demanding upon your stamina. Holes range from 130 to 430 yards. Other practice facilities include a Driving Range with top quality tee mats and golf balls, putting greens, chipping green and a practice bunker. The original course of 6 holes was laid out in 1986. This was followed by the purchase of another larger field in 1990, when the new 9 holes gained English Golf Union affiliation. Following the acquisition of the old railway line in 1997, the course was redesigned with 2 completely new holes. This provides a more spacious set up with added length, leaving the practice ground, which was once part of the first fairway, standing alone. The second 9 holes is played to different flags, providing an 18 hole experience. (see Course map and Scorecard ) The 12 bay Driving Range, Coaching Bay, Golf Shop, Mower Store and Changing Facilities were developed in 2005. Sudbrook Moor Golf Course is maintained and developed with the latest techniques and equipment of Fineturf, one of the countrys leading turf care companies. With a policy of ongoing improvements and refinements, Sudbrook Moor is now considered by many to be the best 9 hole golf course and golf facility in the area, offering great value for money. PGA Professional and Director of Golf Tim Hutton, started his career with 6 years as Assistant Professional to 5 time Ryder Cup Captain, Dai Rees CBE and travelled extensively as a tournament player. He was Club Professional at Sleaford Golf Club for 12 years before designing and building Sudbrook Moor. Tim is an Honorary Member of the Golf Foundation and has received The Sir Henry Cotton Award for meritorious services to junior golf. Tim is a Fellow of The Professional Golfers Association and has been a Midland PGA Professional of the Year, a title since held by Lee Westwood. Recent article: It is 29 years since Tim Hutton left his position as club professional at Sleaford Golf Club to create a new venture with his family at Carlton Scroop. With 20 years in the golf industry to that date, Tim had identified a need for a place that encouraged people to try golf. At the time golf was often perceived to be exclusive, expensive and not always friendly towards anyone wanting to take up the game, particularly children. Furthermore, the only venues that were readily available to budding golfers were limited to seaside pitch and putts and crazy golf. Tim owed his career in golf to Boston Golf Club with the encouragement of the members and the mentoring of Club Professional, Terry Squires. Up to 29 years ago Tim had not seen anything that compared with Boston for the inclusiveness that he experienced there in the 1960s. As a result of this, he founded Sudbrook Moor Golf Club on the principal of “Affordable, Quality Golf for All, in a Friendly Environment”. Since then thousands of local people have experienced the thrill of golf for the first time at Carlton Scroop. A large proportion of the members of local courses, many of these developed in the 1990s, hit their first golf ball at Sudbrook Moor. However, with good all year round ground conditions, the golf course is now well established and is attracting and retaining many golfers in it’s own right. The Junior golfing programme has produced several outstanding players, non more so than 2008 Lincolnshire Amateur Champion, Danny Keddie, who is now on a golf scholarship in Tennessee. Danny started at the age of 6 and owes much of his competitive prowess to Sudbrook Moor members, who allowed him to join them in club competitions, just as Tim had experienced in his early days at Boston Golf Club. Assisted by his wife Judith and sons Simon and Ben, without any subsidy or grant, the family have ploughed everything back into maturing the golf course and the facility that it is today. Judith, a physical education teacher, is Club Secretary and Junior Organiser. A PGA Qualified Professional with 20 years of tournament and coaching experience, Ben has recently taken over from his father as Head Coach. Fineturf, developed by elder son Simon into one of the countries leading turf production, installation and maintenance companies, manages the golf course with Head Greenkeeper, James “Jimbo” Sergeant. Simon and Jimbo have upgraded the 9 hole golf course with many improvements creating an 18 hole experience by enhancing the second round, which is played to different greens and flags. Spending the first 6 years of his career as personal assistant to Dai Rees CBE, 5 times Ryder Cup Captain and golf star of the post war years, Tim Hutton has received national recognition with the Sir Henry Cotton Award for outstanding services to junior golf and is an Honorary Member of the Golf Foundation. As a Midland PGA Professional of the Year, a title since held by Lee Westwood, Tim is now a Fellow of the Professional Golfers’ Association. Drawing on this experience in the current financial climate, the Hutton family are committed, more than ever, to provide the area with “affordable, quality golf for all, in a friendly environment”.